Understanding Islam – Part 73 – The Prison Veil – Wake Up! Wake Up! 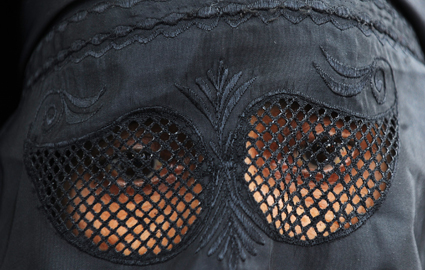 A Meaning of the Veil – One view is that of a jail sentence for all women that are required to wear any form of covering. It is the requirement, not the freedom to choose, that places all veiled women in a prison. They stand in their cell, behind a restrictive barrier, looking out on those who would be free. From the article you will note there is by some voices, even in Saudi Arabia, a stated goal to loosen up the restraints of Wahhabism. The abaya is a start – reveal faces, arms, and even hair. Then there is the question of work for women. Allowed or not. It is being debated. The same source (female – from a Muslim Country)(thank you for your response) that referred me to the above article – responding to the post – Understanding Islam – Part 71 – Beware of Veiled Women (https://tombalderston.wordpress.com/2010/11/29/understanding-islam-part-71-beware-of-veiled-women/) provided the following feedback (note: edited and paraphrased and the most interesting comments to me are italicized). This is the thinking of a more objective female, one who loves Allah (in spite of what I say), and I respect her dearly for her position. We enjoy an open dialog, healthy, and useful for understanding. This article (noted above) quoting Ahmed Alghamdi supports your view regarding the veil. I have no problem whether women cover up or not! I believe the act of covering oneself is up to the person and it is between the woman and God. Wearing of the veil forced by family and traditions is as bars of a prison surrounded one’s life. Such an act of covering has to be done out of conviction. I agree that it is mentioned in the Qur’an (as a covering of piety) but I wonder if there is a verse in Qur’an that states a law for punishing a woman for not covering. The point is to behave in a modest way and to dress up modestly and as you said the verse states that the best of clothes is piety. This is my own understanding but yet I cannot declare it before my people. They don’t understand it that way. All what concerns such people (Islamic fundamentalists) is whether you follow these ‘scales of the faith’ completely. Covered up in black and staying away from men who are not related to you is the ‘scale’; applied by men, also women, to measure the strength of your faith. You cannot argue, debate the issue, as the quarrel would only lead to worse outcomes. I tried once to explain my views to some educated women, school and college teachers, but I realized it is only in vain. They had already formed their concepts, comfortable with what they believe and refused to look at things from another angle. The last time I had a discussion with my sister about Islam, events after the prophet’s death by Muslims, and the potential for some mistaken practices, she resisted, told my mom what I read prepared by non-Muslims is spoiling me, brainwashing me. When I told her I read books and articles written by Muslims as well, she said that ‘they are not Muslims’ but western people who study about Islam and East for their own interests. I told myself ,”The discussion is over, Say no more, Shut up Stupid! It is useless to express one’s views or feelings!”, and became quiet. I am happy with my faith “Islam” and I believe real Islam is a message of love and peace. People’s ignorance and misinterpretation spoil its pure image but these things would not make me hate Islam. My Islam is strong enough and even if I cannot express my views to others, I am happy that I tasted the sweetness of the true faith. I always wanted to see people living without committing bad things like telling lies, stealing, fighting, abusing one another, killing…etc, but these things happen in every society whether it is a Muslim or non-Muslim one. These things were there in the past and will continue to happen till God says ENOUGH! Hatred responded to by hatred causes more enmity. I am upset when I see and hear such things. There is nothing I can do but pray and go on my way educating myself and finding ways that can help me get a good position in my community that enables my tongue to speak and my voice be heard. It is going to take time and it is going to be hard but at the end if God provided me with a long life and a strong will, I would see my dreams coming true. I make mistakes. I learn from them and they help me to improve. I see others’ faults; they help me see my own and seek help from God. The past is behind, I have knowledge and no regrets; I appreciate my present and trust all will get much better in the future. I trust God and clear my heart from bad thinking about people. If you have read most of this posting you see cracks in the walls of areas within the Muslim controlled countries, yet these views are decidedly minority views. There are examples of reversals in moderate thinking, such as in Turkey, where a once secular nation, Muslim but tolerant, are finding women wearing veils and other coverings that had not been the case for a hundred years. There was a political shift in that Country and more seats in the legislature are being occupied by more fundamental Islamic thinkers, with a President in accord with them. Similar change has taken place in Egypt, where the Muslim Brotherhood took hold. It is enjoyable when you meet and are able to have an open dialog with a Muslim, a believer, that welcomes a pluralistic, free, society for all, accepting of other religious thinking, wanting to know what others believe, why and the source. Sharia law is not a goal to be imposed on all, or even part of civil laws, but to be a godly directive for that person. This is the attitude of my correspondent – a person living and precluded from travel from her Muslim country. She has noted in the past the main objective of most in her community is work, finding income to put food on the table and to live – survival. The religion becomes secondary, except as a daily discourse and part of the educational system – often the only part. A punishment for violating religious dictates (a theocracy) also exists; to avoid abuse, prosecution, resistance to change becomes the norm. It has been my experience that once open to other faiths, seeing the truths others accept, understanding and gaining knowledge, Islam is often denied. For those I have encountered who converted to another faith (Christianity primarily – and this is not an objective here – that is between the individual and God) the reason is more because of the extremist actions taken by Muslims (people from Egypt, Lebanon, Syria and Jordan) that have impacted them directly (harm) or their families (oppression). It was disturbing to them and they felt there was a better way and that God would not act in the fashion as they experienced or saw. The impact on the individuals by Islam, the ulema, the Khomeini’s, the totalitarian leaders, the governments, the trends and the zealotry, turned them not from Allah, but towards God, a God they believed was more loving, caring and objective. They sought an Umma of their own nature, where they felt safe, where they felt free. Interestingly enough their freedom is often attacked by those that now see them as infidels. But they understand more, as Christ has related, “because of me you will be hated.” We are not of this world, a world in which Satan rules. We must be prepared for the abuse, resist, remain humble, and know that God has provided the means for our salvation. especially women from ISLAM believers to obey ALLAH LAWS since 14 century ago. Yes, well stated, but this assumes you are ‘free’ to choose. So be it. What about one’s rights to openly discuss their theology? What about your freedom to consider other faiths? I refer to those under a governance that requires the veil.